I recently posted a picture on Facebook of Joshua and I (with Leoni joining in) reading the Bible together one Friday afternoon after work. A few days later, I was speaking with a friend who commented to me how they loved the idea of reading the Bible with their children but wouldn’t know how to do it or where on earth to begin. I am convinced that reading the Bible with our children is not only the main way of bringing our children up to know and follow Jesus, but is also really easy and straightforward (certainly once you have done it a couple of times and overcome the initial uncertainty of what you are doing). And so I’ve written down some brief thoughts on why we should read the Bible with our children and how to go about actually doing it. Why read the Bible one-to-one with your children? This means intentionally speaking, teaching, encouraging and challenging one another about all things to do with Jesus and his good news. While this can take place without opening the Bible (the early Christians in Acts did not have the Bible as we have it, yet spoke the word of God boldly wherever they went (Acts 8:3)), it would be ridiculous not to open up the certain word of God written in the Bible (not to mention extremely proud to think that we can relate the word of God as accurately and effectively as those early believers, having nearly two thousand years separating us from that focal and pivotal point in human history). Fathers… bring [your children] up in the training and instruction of the Lord. Parents, led by fathers (where possible), are to be actively bringing their children up by teaching them the knowledge of who Jesus is and what he has done, and setting them on the path of following him so that they might do so for the remainder of their lives (Proverbs 22:6). The Bible is central to this, as it is the way that children – even from a young age – are made wise for salvation through faith in Jesus (2 Timothy 3:14-15). Putting these two things together – letting the word of Christ dwell in us richly as we teach and admonish one another, and parents/fathers bringing their children up in the training and instruction of the Lord – it looks like parents making and taking opportunities to speak about Jesus from the Bible with their children. It looks like reading the Bible one-to-one with your children. How do you read the Bible one-to-one with your children? When you start reading the Bible (in terms of their age) is up to you. For us, we have been reading the Bible to/with our children in one form or another pretty much since they were born (or thereabouts)! Every day we have family Bible times, and we have occasionally read age-appropriate Bible notes with them, too. However, I have saved reading the Bible as-is (as in, an actual full-text version of the Bible, such as NLT or NIV, and no study guides or notes) until our children reached juniors, so that it has become a mini rite of passage for them. You could start earlier, or you could leave it until later (but be aware that the longer you leave it, the harder it is to get going). I love just sitting down with just the Bible, but you might prefer to have a tool such as Bible notes or a devotional to help you. One each if your children can read, or a good children’s Bible with helpful illustrations for them to follow if they cannot read yet. 20-30 minutes once each week works for us (this is in addition to family Bible time at bed time). This will depend on the personality types of you and your children. For us this looks like going to a coffee shop and having a coffee and a kids hot chocolate together after school. Find what works best for you and your children. In particular, try and find a context that your children will feel comfortable in and will help them look forward to meeting together (but are still places where you can chat undisturbed). Possibilities include Saturday mornings in your front room, Sunday afternoons after lunch, or getting up a bit earlier and sitting in the car outside the school gates. Other than that, you just need to decide on which bit of the Bible you are going to read through and go from there. For infants, you might want to start with an Old Testament narrative such as Ruth, Esther or Jonah (although these are typically Sunday group fodder, and any child that has grown up in a church will probably have looked at these stories several times already! ), alternatively you could go for a straightforward gospel book, such as Mark. For juniors, you could read through one of the New Testament letters, such as Colossians, 1 Peter or Philippians. 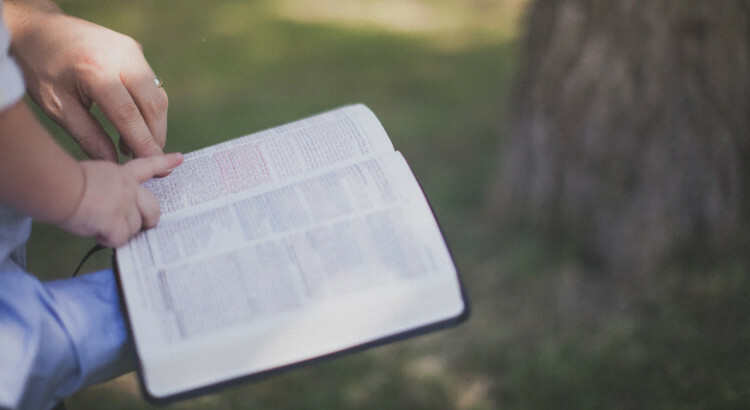 For older children and teenagers, you could get stuck into more complex bits of the Bible, such as the whole of Daniel, Revelation or Proverbs. Start your time in prayer, asking for the Spirit to be at work in you and through you as you read the Bible together. One (or both) of you read the passage out loud. Choose chunks of the Bible that are not too long but also not too short either (it may help to spend 5 minutes or so beforehand working out which verses you will read). Then spend time talking about what things are surprising or amazing, what things you find difficult to understand or hard to put into practice. Nail down what the big idea of the passage is together, and work out how Jesus is the hero. The whole Bible is about Jesus: foreshadowing and anticipating him in the Old Testament, testifying and teaching about him in the New Testament. Therefore, the point of every passage is to open our eyes to see more clearly who Jesus is and what he has done for us. Finish by thinking about what we should do in return. Work out what a faithful follower of Jesus looks like from the passage, and start to talk about what difference it might make to what we think, what we believe and how we live. Finish off by praying in the things you have been talking about. Give thanks for what you have read about Jesus. Ask the Holy Spirit to change you to be a more faithful follower of Jesus. Honour God the Father together as you pray. The Word of God is described as being a sharp double-edged blade that can cut to the heart, and the sword of the Spirit to be used as a battle weapon (Hebrews 4:12-13 and Ephesians 6:17). When you apply this imagery to reading the Bible one-to-one, it is sobering to think that we are essentially taking a spiritual scalpel to our children’s hearts and placing in their hands a formidable spiritual weapon. With that in mind, we need to make sure that we are reading the Bible humbly as one brother in Christ helping another sibling – and as they grow they will, in turn, help us too. We also need to make sure that we wield this deadly weapon carefully, avoiding religion and irreligion. Religion (or, more accurately, wrong religion) is where God’s affections, forgiveness and salvation depend on and flow out of our obedience. This is not the message of the word of God. Jesus has secured the Father’s affections, he has granted our forgiveness, and he has purchased our salvation – all that we do flows out of all that Jesus has done for us, not vice versa. Irreligion is where the grace of God in forgiving our sin means that we are free to live as we please. This is also not the message of the word of God. Not only does our forgiveness and salvation come at a great price (the blood of Jesus) but we are forgiven and saved from sin to live for God (1 Peter 2:24). Reading one-to-one with your children is a serious business. Every time Joshua and I sit down with our flat white and hot chocolate and our Bibles open, I remember that I am helping him take his first steps of listening to his saviour and walking with him on the perilous road of life that lies ahead. He is still a child, but this is not child’s play. However, it is also one of the life’s great privileges and an enormous blessing to me, let alone Joshua, to be able to open up and let the King of kings speak to us together as father and son. So allow me to encourage you to not just take up this responsibility seriously… delight in it, because reading the Bible with your children is truly a fantastic gift of God’s grace that is ours to be enjoyed.